The following is the account of a week in Norway in June 2003 in the company of John 'Jock' Morrison who returned 61 years after crash landing there to thank the Norwegian people who had assisted him and other members of his crew after they found themselves on the run in German occupied Norway in 1942. If your connection is slow it may take some time to display the many images on this site but there is plenty of text to read while you wait! You can use the links below to navigate between the other pages that deal with this story. To return to this page use the 'Back' button on your browser. The alarm clocked buzzed me awake shortly after 0400 hrs - not my favourite time of day it has to be said, and not a time of day that I have seen too often in my life either! However, the excitement of the journey ahead and my destination, Norway, soon shook me into semi wakefulness. One major consolation of having to be up and about at such an early hour was that I was able to witness the eclipse of the sun en route to the airport. An unforgettable start to what was to be an unforgettable week ahead. I was flying to Norway from Scotland. John and his daughter Lynn were flying from England. After giving an interview to a local BBC radio station a few weeks prior to the trip during which he explained the reasons for visiting Norway, the local BBC TV news picked up on the story and decided to send a cameraman and reporter to film the first few days of Johns trip. They were to fly out with John and Lynn, we were all to meet at Amsterdam airport to board a flight together to Trondheim due to arrive there about lunchtime. On arrival at the airport I duly stood in the queue to check in for my KLM flight to Amsterdam. Time was marching on and things weren't moving along at a very rapid pace when all of a sudden the flight was closed leaving myself and 24 other passengers in the lurch. KLM had in their infinite wisdom overbooked the flight by a huge amount and it was of no consequence to them how far in advance you had booked your seat or that you had taken the time to confirm it in the days leading up to the departure. Likewise, they did not appear to worry that most of the passengers left behind had connecting flights to pick up in Amsterdam that they would now miss as a consequence. So, I had a further three hours or so to wait in Scotland, followed by an eight hour wait for a connecting flight in Amsterdam before finally arriving in Trondheim at 2300 hrs. I was not impressed! Thankfully, Morten, John and Lynn were at the airport to meet me and it was so good to be in Norway again. It barely gets dark for a moment there at this time of year so we were able to enjoy the beautiful scenery on the drive to our accommodation at Øysand on the shore of Trondheimfjord. Our accommodation was a lovely wooden building with bedrooms, open plan sitting room/kitchen and a bathroom. Outside there was a small veranda and we were only a stones throw from the shore. It was perfect and suited our requirements for the week very well indeed. Our first port of call was a visit to Stavne Cemetery in Trondheim. We were to have gone there after our arrival on Saturday, but as I flew in so late we had to reschedule. There are a total of 155 Commonwealth War Graves of allied servicemen from WW2 at this cemetery. 27 Navy, 24 Army, 99 Air Force, 5 Merchant Navy, of which 140 are British, 6 Canadian, 5 Australian, 3 New Zealand and 1 South African. On the way to the cemetery we stopped to gather small bunches of white wild flowers, wood anemone, which grow in profusion all around the Norwegian countryside in May and early June. I placed some flowers on Archie's grave while John placed some on the grave of his fellow Wireless Operator Rusty Russell. After a time for reflection we had to leave but would return once again before leaving Norway to say our farewells. The graves of many of the men who died during the operations flown by the RAF against Tirpitz in Faettenfjord are at Stavne, including that of my grandfather, Flight Sergeant W B 'Archie' Archibald who died on the night of March 30th 1942, and Sergeant C F 'Rusty' Russell who was the 2nd Wireless Operator/Air Gunner on Johns crew, killed during the attack on the night of April 28th 1942. The names on many of the grave stones at Stavne are familiar to me from the research that I have done and although I knew none of the men personally (they died before I was born) I feel a great affinity to them and a gratitude for the enormous sacrifice they made as such young men. I stop by each one of them and pay a silent tribute. For those who died and have no known grave there is a memorial cross which stands centrally in front of the Commonwealth War Graves. Here John and I paused in silent tribute to remember them and laid a small bunch of the wild flowers. We were due at Vaernes airport next but not to fly back to the UK quite yet. Morten had arranged a rather special trip for John in a small Cessna plane. We arrived and met the pilot, Øystein Belsvik. In 1992, Øystein had been one of the pilots who flew in a small formation of aircraft over Faettenfjord during a ceremony to mark the 50th Anniversary of the attacks against Tirpitz. He was very much looking forward to the flight he was about to take John on. The size of the aircraft and the amount of fuel it was required to carry meant that only two passengers could be carried onboard as well as the pilot. John and his daughter, Lynn were the two passengers. It was to be an incredible experience for them both. Their flight would take them up and would retrace the bombing run up the Johns Halifax took over Faettenfjord in 1942 before flying them over Lake Hoklingen where Halifax W1048 TL-S crash landed on the night of April 27th 1942, Markabygd, the area where the Halifax eventually crash landed. They would then follow the route that John and Reg took on foot over the mountains to Vikvang Farm where they received help from Odin and Mette Vikvang and then over Sul and Bjørndalen where they were eventually captured. The Cessna would then return to the airfield at Vaernes. Meanwhile, Morten, the BBC team and myself drove to the head of Faettenfjord where Tirpitz had been moored so that we could watch the Cessna fly over. Discussing the raids with the BBC at the head of Fættenfjord while waiting for the Cessna with John onboard to fly over us. John recreating the flight of W1053 TL-G over Fættenfjord at a height of 1500 feet in 2003 rather than the 150 feet height he flew at in 1942. In due course we spotted a tiny speck in the sky heading towards us. It was the Cessna with John and Lynn onboard. It passed over Saltoy island, the landmark that the Halifax aircraft had used as a guide to line up their bombing run on Tirpitz and headed straight towards us and over our heads. The small Cessna was flying at a height of 1500 feet (457 m) and it was daylight. What I tried to remind myself as I watched it was that the Halifaxes in 1942 had been flying at a height of 150 feet (46 m)! They were also flying in the dark through a thick smoke screen and were being shot at by every available gun in the vicinity from below and from AA positions above on the sides of the fjord. The Halifax had a wing span of over 98 feet (29 m) and was over 70 feet (21 m) long and more than 20 feet (6 m) high. The Cessna with its wingspan of something in the region of 35 feet (10.5) was tiny in comparison. I was left in awe yet again at the skill and courage of those aircrews who had flown that route in 1942. The Cessna flew over Faettenfjord once then flew over Hoplafjord and Lofjord, just as many of the Halifax aircraft would have done in 1942, before passing again over our heads at Faettenfjord and heading off in the direction of Lakes Hoklingen and Movatnet. We were waiting at the airport when John and Lynn landed and could tell by the ear to ear smile on Johns face that the trip had been an experience he had enjoyed. Both John and Lynn were ecstatic. When asked about it, John said it was absolutely exhilarating and memorable, a truly unforgettable flight. He also admitted that he had been more frightened in the Cessna at times than he had been in the Halifax as he was more accustomed to being in a large aircraft and every time the Cessna banked to turn he felt he was going to fall out! We ended our day with a wonderful meal at Morten and Hege's home which has a spectacular view over Trondheimfjord allowing us to watch the sun sink lower in the sky but never disappear. A bright, warm and sunny Norwegian day greeted us. Just the kind of weather I have come to expect on my visits to this country! Today was the day we were to attend the unveiling of a memorial to mark the location of the Halifax W1053 crash site and the loss of the 2nd Wireless Operator, Sgt Russell. It was also the day when John would finally get to meet some of the people who had helped his crew in 61 years ago. We drove to the small village of Markabygd where we met and were introduced to Mr Asbjørn Andresen who was responsible for the organisation of the days events. At a small Christian Meeting Hall in the village a group of guests awaited our arrival. Among the guests was Oddlaug Sørmo (the lady who had translated for John and crew in 1942), her son Skule and his wife, Britt. I had met Oddlaug Sørmo and Skule on a previous trip to Norway and it was lovely to see them again. John was reintroduced to Oddlaug which was a very moving moment. They both remembered their last meeting in 1942 well, and finally John was able to give Oddlaug his grateful thanks for the help she gave him in translating, attending to their wounds and making some sandwiches for their journey. Olav Vikvang grandson of Mette & Odin Vikvang who gave help at Vikvang Farm was also present, and again John was able to give his personal thanks to the Vikvang family for all that they had done. During coffee and delicious sandwiches and cake, made by the local ladies, we were warmly welcomed followed by some speeches and introductions with an explanation of who everyone was and the part they had in the story. Much of this was in Norwegian so I hope I will be forgiven for not being able to recount it all here! After this little gathering we jumped back in the car and drove the short distance to where the memorial stone had been erected. By now the temperature had risen and it was a boiling hot day with a gentle but very welcome breeze blowing. We arrived at the site, which is situated, beside Elverum and Sørmo Farms at the side of a little track surrounded by farmland. The local community had turned out in force for the occasion, farmers had stopped work to come and watch and some children from the local school were present and planned to write about it for their project. 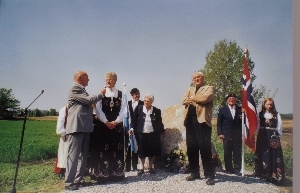 Seated left to right front row at the memorial site: Lynn Defty, John Morrison, Linzee Druce, Morten Moe and Asbjørn Andresen. 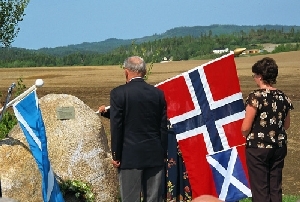 There were Norwegian and Scottish flags fluttering around the place and a Norwegian flag planted in the field behind the memorial stone marked the exact spot where the aircraft had crashed in 1942. The memorial stone, a large granite boulder with a brass plaque, was flanked on each side by a flag bearer and two young girls wearing their National costumes. Carrying the Norwegian flag was Johan Vist, the Scottish flag was held by Egil Sørmo. Egil's parents, Anna and John, were the owners of Sørmo Farm when John, Reg and Dennis were taken there in April 1942 and it was Egil who had run to a neighbouring house to fetch Oddlaug Sørmo (then Øvreness) to come and translate for the airmen. There were reporters from several of the local newspapers present as well as the BBC who had come with us to film the occasion for broadcasting on the local news channel in the Teesside area where John now lives. Several speeches were made, and John also had the opportunity to publicly thank all those who assisted the crew of W1053, as well as the local community for their presence, support, welcome and for erecting such a fitting memorial. As our multi talented compere for the day, Andreas Lunnan, played the Last Post on the trumpet, John, with Lynn and myself either side of him, laid a wreath in memory of Wireless Operator, Sgt 'Rusty' Russell who had tragically died some time during the attack on Tirpitz or when the aircraft had crashed. At the crash site, which is currently a ploughed field, small pieces of wreckage can still be found turned up every year as the land is ploughed and sown again. After the formalities were over there was an opportunity to spend some time mingling and talking to some of the many people who had taken the time to come along. There were such a lot of people and so many introductions and names to remember that it is not possible to mention all here. Suffice to say that John, Lynn and myself were so appreciative of all who turned up and were very honoured to have been able to meet and talk with those we were able to. We could have talked on for a great deal longer, and I fear that we may have stayed on too long as it was, however, we had a further engagement to get to. A reception was being held for John in the Community Hall in Markabygd and by the time we arrived everyone was already there and waiting for us! We were greeted and welcomed at the entrance by Mr Asbjørn Andresen and the young girls in National costume after which John entered the Hall to rapturous applause from the patient guests. We were served a superb meal and enjoyed the company of those around us. After the meal there were several speeches and presentations. John was presented with gifts from the local community, a flag and a beautiful crystal vase both of which had a symbol of a horse on them which is the emblem of the area we were in. He was also presented with a lovely cheese slice. Lynn and I both received very beautiful blue and white wall plates showing a picture of the church in Markabygd as a memento of our day there. It certainly was a day not to be forgotten. Throughout the day John was shown or presented with mementoes from the crash. One lady brought a small lamp stand to show him which had been made from several parts of wreckage from W1053. Another lady presented him with an aerial photograph of Lake Movatnet and the farms where W1053 crashed. He was even presented with the Navigators compass from W1053 by a man who had found it in the days after the crash. During coffee, Andreas Lunnan treated us to a selection of Scottish tunes and melodies expertly played on the piano, which was very much appreciated. After coffee and more cake than is good for ones health and waistline, we finally said our thanks and farewells to everyone and headed back to Øysand for he night. It had been quite a remarkable day, expertly and efficiently organised and absolutely unforgettable, certainly by John, Lynn and myself. The community of Markabygd should be justly proud of themselves. Once again the sunshine was with us and the weather was warm. Really, I believe this to be situation normal in Norway but people keep trying to persuade me that this is not so! I'm having a hard time being convinced as it has been lovely weather on my previous two visits to the country. Our schedule for today would take us to visit the Vikvang Farm and then to follow part of the route John and Reg would have taken during their attempt to reach Sweden. Before this however, we had another important visit to make. Shortly after John, Reg and Dennis had escaped from their burning aircraft they encountered a tall figure who emerged from the darkness. Friend or foe? There were not to know in those first few moments. Fortunately for them he was to be a friend. His name was Ingvald Arnstad and he had watched the burning aircraft from a window at Sørmo farm as it crashed nearby and had rushed out to see if he could help. Ingvald had been unable to attend the memorial service and reception the day before and so had invited us to join his family for coffee in his home which we were delighted to be able to do. It was a touching moment to watch John and Ingvald greet one another again, this time in daylight under much less stressful circumstances. Over coffee and more delicious cake, Ingvald explained to us his recollection of events from the night of the crash. Watching John and Ingvald talking together via an interpreter it was amazing to think that the last time they had met was when they were both young men in their early 20's. All too soon it was time to bid our farewells and head off for our next meeting. We left the Arnstad family and headed for the Vuku area to meet up with Einar Bjørsmo. We arrived at Einar and Inger Bjørsmos farm and were greeted by them both and two cheerfully barking dogs. We were also introduced to two journalists from local newspapers, Tronder-Visa and Verdalingen who would join us for most of the day to cover Johns story in their local area. Setting off in the cars, we followed Einar the short distance to Vikvang farm where his grandparents had lived when John and Reg had appeared seeking help in early May 1942. The farm is no longer owned by the Vikvang family but we had kindly been given permission by the current owners to make a visit there although they would not be at home that day. On arriving at Vikvang Farm John looked all around him to get his bearings. He could recall the place well and pointed out to us where he and Reg had descended down a hillside and sat in the cover of some bushes watching the farm before deciding that it was safe to approach and ask for help. We spent some time discussing the events of 1942 at Vikvang and before leaving we placed a small Scottish flag beside two small Norwegian flags which had been left flying in an arrangement of birch twigs beside the house by the owner, just to let them know John had been there again. We took a road which followed the River Inna and headed towards Sweden and stopped briefly at Vaterhalmen where Einar explained that there had been a German barracks during the war. Here the river runs through a very narrow valley with steep, almost sheer cliffs on either side. During their escape, John and Reg would have passed through the mountains a little way off from this point. Looking at it, even in the sunshine of 2003, it is hard to see how anyone would have been able to pass along the road at this point. It would have been very heavily guarded, and even had guard posts and gun positions cut into caves in the cliffs high above the river. We followed the road from Vaterhalmen to Sul and stopped at a point a short distance from the other side of Sul. This was Bjørdalen where it's believed that John and Reg were finally captured having been given away by the footprints they left in the snow. The existing road is a new road. In 1942 there was no more than a rough track, traces of which are still visible today. We parked the cars and took a stroll along part of the old track. Today it is a beautiful setting, the track through the forest overgrown with grass and wildflowers, a small burn rushing down between the trees in the forest, a far cry from the way it would have looked to John and Reg all those years ago when it was dark and covered with snow and they were fit to drop with exhaustion. John looks thoughtful at Bjørndalen near the spot where he and Reg Williams were captured in May 1942. Back on the road again we continued our journey and arrived at Sandvika Mountain Lodge. During the war the Germans had used the Lodge as a border post since it was but 300 meters from the Swedish border. We know that the Canadians, Pilot, Johnny Roe, and Tail Gunner, Bill Parr were taken here after they were captured as John had a photograph of them with their German captors which was taken there in May 1942. John and Reg too were taken to Sandvika immediately after their capture which was a day earlier than the Canadians. Today there are some new buildings in addition to the original buildings which still stand where they did in 1942. Standing in the courtyard we were able to work out where Johnny Roe and Bill Parr were standing when they had been photographed there and we took some 2003 images from roughly the same spot. 1942 Sandvika, Reg Williams and Johnny Roe from W1053 TL-G with their German captors. From Sandvika Mountain Lodge it seemed only natural that we should make the final part of the journey that regrettably John and Reg had been unable to complete during the war. That was, of course, a trip over the border and into Sweden. Had they succeeded in this objective in 1942 there may have been a different tale to recount today with other brave people to include. It was certainly not through any lack of effort on their part, or of those who had helped them that they had not made it to Sweden. It was quite incredible that they had firstly survived being shot down in a blazing aircraft, but to have succeeded in covering the distance that they did despite their injuries was indeed a remarkable achievement in itself. After our brief foray into Sweden we headed back to the home of Einar and Inger Bjørsmo stopping briefly at a bridge over the River Inna where it's believed that John and Reg must have crossed during their escape. At Einar and Inger's home we sat out sheltering from the blazing sun under the shade of some trees talking over the events of the day and of 1942 while having coffee, sandwiches and delicious cakes as well as a cold drink to quench our thirst. A bit of a grey day and a little cooler than we had experienced to date, but not too bad all the same. The day started off very well with the sighting of a white tailed sea eagle being chased and tormented by seagulls, which looked minuscule in comparison. This spectacular was watched from the comfort of the veranda of our accommodation while sipping a morning cup of coffee. Plan of action for the day was to visit the hut by lake that John and Reg had broken into during their time on the run in Norway and hopefully also to stop by a memorial to the crews of a Lancaster and Halifax which were both shot down with the loss of all onboard the night before W1053 being shot down. A very brief stop was made at a shopping centre in order to purchase a new battery for my camera which had died on me at a crucial moment the previous day and also to allow John to purchase Norway football strips for his grandsons. Once on the road we passed the by now familiar landmarks of Fættenfjord, Lake Hoklingen and the village of Markabygd. Somewhere between Markabygd and Tomtvatnet we stopped on a small back road to pay a road toll. Two men were fixing up the toll station and Morten got chatting to them as he paid his fee. John and Lynn thought they recognised one of the men, and sure enough he turned out to be the man who had presented John with the Navigators compass from W1053 on Monday. What a fortuitous meeting as it enabled us to take a photograph of him, which was something we had not managed to do on Monday. The planning on this trip could not have been better organised! John (centre) with the two men we met on the road to Tomtvatnet - the man on the right had found the Navigators compass after Halifax W1053 TL-G crashed. Eventually we drew up in a small parking place at the side of a track. A small path through the heather and scattered birch led us downwards towards Lake Tomtvatnet. At the bottom of the path was a lovely little hytte (a small wooden house or hytte) with the Norwegian flag flying proudly from the gable end. We were welcomed most warmly by three generations of the Venås family, relatives of Tormod Langeland, who now own the hytte. Vidar Venås, his wife, Randi and daughter who now own the hytte, Tormod Langeland, Tormod's sister, Bergleot, and Einar Bjørsmo. Einar, who we spent the previous day with in Inndalen, was the one who had worked out that it was Tormod Langelands hytte that John and Reg had visited in 1942. It was here that John and Reg broke the door in and spent a night and a day when they were so exhausted that they could go no further and needed some shelter and a bed to sleep in. The current hytte is not the one that John and Reg broke into, it was replaced some years ago by the one that now stands in it's place, however, many of the features and contents from the old hytte still exist in the new one as we were to discover. As the coffee was poured into the pretty cups we were told that they were the same cups that had been in the hytte in 1942 when John and Reg had stayed there. Not only that, but the little jug that the milk was poured from was the very same jug that John and Reg had left the money sitting under on the table all those years before to pay for the broken door lock. Even some of the wooden beds in the hytte were from the original hytte. Although the hytte that John and Reg visited in 1942 has been replaced by a newer one, it's clear that there is still a strong tie between the old and the new by the inclusion in the new hytte of so many of the bits and pieces from the original. John and Tormod enjoy their coffee from the same cups that were in the hytte John visited in 1942. The little jug the money was left under sits between them. Olav Vikvang arrived to join in the little party on the shore of Lake Tomtvatnet and a very pleasant afternoon was spent talking, drinking coffee and eating too many good things again! John declared that if he and Reg had realised in 1942 what an idyllic location they had stumbled upon then they would have stayed on and would probably have still been living there now! He presented the Venås family with a Scottish flag to fly from the hytte so that he would be able to find it easily next time he visited and was presented in return with a framed photograph of the original hytte. Tormod presents John with a framed photograph of the original hytte where he stayed in 1942. It was time to leave Tomtvatnet and move on to our next destination. We climbed back up the little path to the car and set off along the dusty track. With Einar Bjørsmo following behind, we drove around Lake Tomtvatnet and then took a track leading up to a high point in the area in order to survey the landscape that John and Reg had been travelling through in the snow in April 1942. In June 2003 there were only tiny patches of snow to be seen on the higher tops in the area. After surveying the lie of the land we headed off in the direction of Markabygd again. 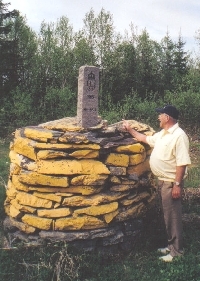 A stop was made at the memorial stone for W1053. When we had been there on Monday for the unveiling it had been such a busy time for us all. This time we were the only people around and it gave us the opportunity to appreciate it in full and to have some photographs taken beside it. Egil Sørmo was on his way back to Sørmo Farm and stopped to have a chat with us. It was nice to see him again. Our next destination was a memorial stone at Borås which commemorates a Halifax crew of 6 airmen from 35 Squadron and a Lancaster crew of 7 from 97 Squadron who all died during the April 27/28th attack against Tirpitz in 1942. We were meeting a reporter from a Norwegian TV station there who wanted to interview and film John. We collected some wild flowers and tied them with a ribbon to lay at the memorial. John was interviewed by the memorial and then we made our way a little further on to where there is still some wreckage from the 35 Squadron Halifax W1020 TL-K. John did a further interview at the crash site before we all made our way back to the road again and after saying our farewells to Einar we headed back to Øysand where we had coffee and cake with Mortens parents before returning to our accommodation for the night. This morning we travelled to the head of Fættenfjord to visit the memorial erected by the local people in memory of all the allied airmen who lost their lives during operations against Tirpitz. We were meeting two members of the Åsen Historical Society, Øyvind Fiskvik and Kåre Vordal, who would later take us to visit their museum. They were waiting for us when we arrived. We spent some time at the head of Fættenfjord discussing the attacks against Tirpitz and took some photographs at the memorial before setting off for Åsen to visit the museum. Coffee and a sandwich taken at a picnic bench outside the museum fortified us for the afternoon. Just as we were finishing and preparing to start our tour of the museum the heavens opened. Rain? In Norway? I was very confused! The museum at Åsen is run by volunteers and they do a brilliant job. Their aim is to present the history of the area through a variety of displays and artefacts which are gathered from all around the community either as donations, gifts and from time to time an item is purchased. Where space permits, an entire room is devoted to a particular display so that they can recreate a small shop from times gone by, a school room or a workshop so that the visitor can experience a flavour of how things looked and how things were in the past. It's very much a living museum where you can not only see the exhibits, but because of the buildings they are housed in and the way they are displayed you get a real sense of how they would have been used in the past and who would have used them. You can almost smell the history there. There is of course a room dedicated to the war history of the area too and we all found that of great interest. Items from the Norwegians, Germans and the Allies are displayed side by side with information about each. There are maps, documents and photographs too. One exhibit in particular caught my eye. It was a RAF uniform which had been presented to the museum by Don MacIntyre who was the Pilot of Halifax W1048 TL-S which was shot down on the attack against Tirpitz on April 27th 1942. John visited Don MacIntyre last summer during a trip to Canada so we took a photograph of his uniform on display in the museum to send on to him. Our visit to the museum was over and the rain was coming down in absolute torrents. Kåre Vordal, from the museum, was to accompany us for the next stage of our day which was a visit to the Lofjord and Hoplafjord. These two small fjords extend from Åsenfjord and lie to the north of Fættenfjord. Both were used extensively by the Germans during the war, particularly when Tirpitz was berthed in Fættenfjord. In Lofjord three of Germany's great heavy cruisers were moored in the spring of 1942, Admiral Scheer, Admiral Hipper and Prinz Eugen. 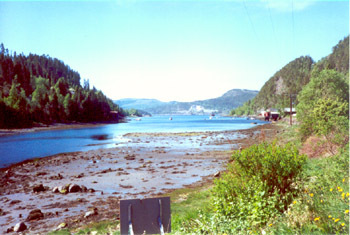 Hoplafjord housed workshops and accommodation. We drove to Lofjord and Hoplafjord and Kåre braved the rain as he explained to us how things would have looked in these areas in 1942 and showed us photographs that had been taken at the time. We eventually had to admit defeat and cut our visit short and bid a farewell to Kåre. We had learnt a great deal more but it wasn't the weather for hanging around chatting outdoors. One thing in particular that I had learnt was that it really does rain in Norway! Our next appointment was with Mrs Oddlaug Sørmo who had invited us all for coffee at her home. In 1942 she had been Oddlaug Øvreness and was living in a house near to Sørmo Farm when Halifax W1053 TL-G had crash landed. She was the lady that was sent for in order to translate for the airmen who were being taken care of at Sørmo farm. We arrived and were greeted by Oddlaug, her granddaughter Ida Marie, her son Skule and his wife Britt. As we sat drinking coffee and eating the most incredible cakes which Oddlaug had baked herself, John and Oddlaug exchanged their recollections of the dark night they had first met in April 1942. After much chat and much cake we said our farewells to the Sørmo's and headed back to Øysand for the night. Our last full day in Norway, but what a week it has been. Truly unforgettable. Our plan was to take a drive down to the mouth of Trondheimfjord which we did, enjoying the changing scenery of the landscape as we went. We took a ferry crossing from Valset to Brekstad and had a tour about the peninsula there which is incredibly flat in comparison to the countryside we had become accustomed to during the week. Returning to Brekstad we had a bite to eat and then headed to Austråt where the giant C turret, a triple 280 mm armoured turret, from the German battleship Gneisenau is situated. Beneath the turret there are five floors and many tunnels which run into the bedrock. Supplies, ammunition and many men could be accommodated here. Gneisenau C turret at Austråt. Apparently the white writing beside me says 'do not climb on the gun' - oops! Must brush up on my Norwegian! We continued our journey and headed for Rørvik where we would catch the ferry back over Trondheimfjord to Flakk. Before doing this I had two very important things to do. When my grandfather was shot down in March 1942, two very brave brothers, Jan and Ingvald Steinsvik saw the aircraft crash in flames on the waters of Trondheimfjord. With little regard for their own safely, they took a small boat out onto the water and tried to reach the aircraft to see if there was anyone they could rescue. Members of their family on the shore were fearful for their safety and called for them to come back. Eventually they had to turn back as the Germans had searchlights sweeping the fjord and there was still gunfire in the area. They had been unable to find any of the airmen in the water. Before catching the ferry we had been invited for coffee with Kristian Steinsvik and his family. It was Kristians father and uncle who had so bravely tried to help my grandfathers crew from Halifax R9496 TL-L Sadly the entire crew perished in the crash. I had visited Kristian, his wife Inger and their two young sons, Stein and Ingar last year when I was in Norway. It was wonderful to see them all again and to be able to introduce them to John Morrison who they were very pleased to be able to meet. John, Lynn, Morten and I sat with the Steinsvik family drinking coffee and talking.with a wonderful view looking out over Trondheimfjord through the large picture windows in their living room as the backdrop. All too soon it was time to leave but I had one final place to visit before leaving the area. 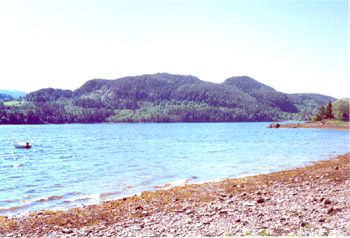 We drove a little way along the shore to Hassel Bay. It was here, not far out from the shore that Halifax R9496 TL-L with my grandfather as Pilot crash landed in flames on the night of March 30th 1942 killing all onboard. I walked the shoreline for a short while before sitting alone for a while on the pebbles with my own thoughts for the crew members who had lost their lives at this place. This was my second visit, and each time I have felt an overwhelming sadness but also I find it a comfort to be so close to the place where it all happened so many years ago. It is a beautiful place, very tranquil and I hope to return often. Lynn, John and Linzee with the area of Trondheimfjord where Halifax R9496 TL-L crashed behind them. There was little time to spare if we were to catch the ferry so we headed back to Rørvik and were one of the last cars onboard before she sailed. Once on the other side it wasn't long before we were back at Øysand and our little hut by the shore. It was time to pack up so that we were ready to leave in the morning. We had managed to fit so much into our week, but it still felt like we had been in Norway no time at all. And so the end of our trip had finally arrived. Morten collected us after breakfast and we loaded our bags and cases into his car and set off for Værnes airport. Before leaving Norway we had one final visit to make. We stopped off at Stavne Cemetery again to bid our farewells to those who lie there. There are too many, far too many, they are far from home but they will not be forgotten. They must not be forgotten. We flew out of Norway with a great deal of extra baggage in the form of many, many memories of the incredible journey that we had made during the week we were there. Our schedule for the week was expertly put together by Morten Moe. I won't embarrass him by saying too many kind things about him, but our heartfelt thanks must go to him for arranging such an unforgettable trip. Every one who is mentioned by name in this account of our week is also due an enormous takk for the part they played in making us so very welcome. There are also so many who I have not mentioned by name but who played an equal part in making our week in Norway such a special one and to all of them a grateful thanks too. John Morrison. The week was the fulfillment of a wish made a long time ago. For John Morrison the journey back to Norway to meet and thank the people that helped him and the other members of his crew has been the fulfilment of a wish he has had since 1942. I am indebted to him for allowing me to be part of fulfilling that wish. It is something that will remain with me for the rest of my life. Right: Linzee reflecting on a memorable week in Norway. Mange takk for alt Norge. Jeg håper returnere igjen snart.